In collaboration with Tim Smith Racing(TSR), MaxAmps introduces the next generation in 1 cell drag racing technology. This custom 9750mah 1S LiPo battery pack holds incredibly high voltage under load during the most extreme amp draws generating the highest output available. The secret behind the success of this battery is our award winning 3250mah cell. By connecting these cells in parallel it distributes the power load between three different cells(cores), resulting in lower resistance and the most rapid voltage recovery of any drag racing battery pack we have ever tested. 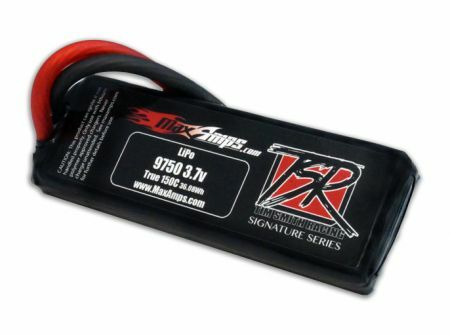 This TSR Signature Series battery is designed for the wires to exit out the middle of the battery pack to better fit the tight spaces available in drag style RC applications. It is also built with high-grade 8AWG wire for maximum power output. Don't settle for second place! Choose MaxAmps and the 9750 Tim Smith Racing Signature Series Battery.